A graphene hydraulic ‘nano-press’ has proven its potential to develop 2D materials by applying pressure on the compounds that are trapped between graphene layers. 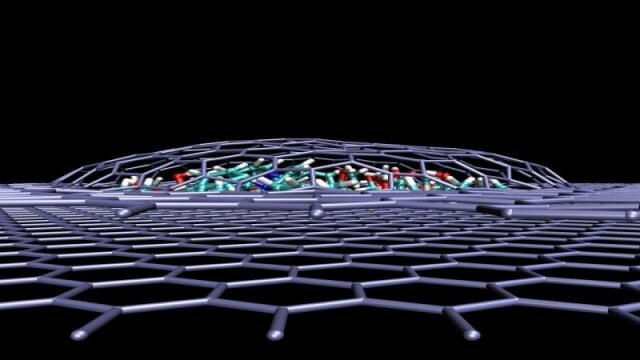 The first-ever 2D material, graphene has a new property to add to it's extensive list. New research has illustrated that sealing molecules betweeen two atomically thin sheets of graphene creates such extreme pressure on the molecules that they modify their state into new crystals. The research team, headed by Professor Rahul Nair from the University of Manchester have presented the details of its study in the journal Nature Communications. The study has discovered a new method to create new materials that are widely applicable, flexible, and have unique characteristics. Graphene, which is more powerful than diamond, enables huge amounts of pressure to be applied on molecules trapped between its layers, without breaking the layers. This unique property of graphene makes its ideal for the ‘nano-press.’ When a layer of graphene is placed over another, it results in the creation of a self-sealing envelope that can secure the molecules between them. The pressure experienced by the molecules trapped between two graphene sheets is equal to 10,000 times the pressure of air in a bicycle tire. Due to this extreme high pressure and large confinement of trapped molecules, these graphene enclosures effectively act as a nano scale pressure cooker which works at room temperature. When graphene was initially isolated and examined in 2004 at the University of Manchester, the exceptional properties of 2D materials that can improve the manufacturing methods of batteries, composites and electronics among others were discovered. The study widened the understanding and knowledge of atomically-thin materials, apart from graphene, and also led to the discovery of a complete set of 2D crystals. This discovery has paved the way to expand the resources used by researchers to develop applications and devices in the future. A previous study that explored water molecules at the nanoscale, conducted at the National Graphene Institute, prompted this new research. In a never-before-achieved feat, new 2D crystals made of calcium oxide, magnesium oxide and copper oxide were developed at room temperatures through this new technique. Exposure to extreme levels of pressure and heat was required previously, to convert salt solutions like magnesium chloride and copper sulphate, to develop crystals. However, the new approach discovered by the team achieves the same outcome at room temperature by creating pressure in one nanometer enclosure present between two sheets of graphene. The observed effects are not limited to graphene enclosures; other 2D crystals can be used, too. Our study shows the possibility of exploring high pressure chemistry and physics at the nanoscale using the graphene hydraulic press. Research to fabricate heterostructures by stacking various atomically-thin materials is underway. Scientists are also exploring different heterostructure systems such as nano-sized LEDs. The recent study provides an opportunity for the researchers to study the effect of sealed molecules in new heterostructured systems. These effects can have either positive or negative impacts on their work. New and exciting ways to explore and understand the world on an atomic level has come up. These ways can also make the commercialization of new graphene-based systems a reality sooner than later.